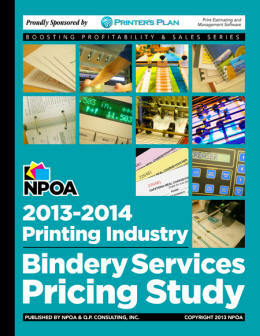 This brand new, 140+ page study, published by NPOA and QP Consulting, Inc., and co-sponsored by Printer's Plan and EFI, is the most comprehensive study of pricing for bindery services and products ever published in the printing industry. To view the bindery services covered in this study, please check here to view the Table of Contents. This just-released study, sold with a 100% Money-back guarantee if you are not totally satisifed, is available either as a tape-bound report or as a PDF. All hard copies are shipped out via Priority Mail within 24-hours from the time the orders are received. PDF copies are normally shipped within four hours.